Press release from Elmscot Nantwich Day Nursery and Nursery School. 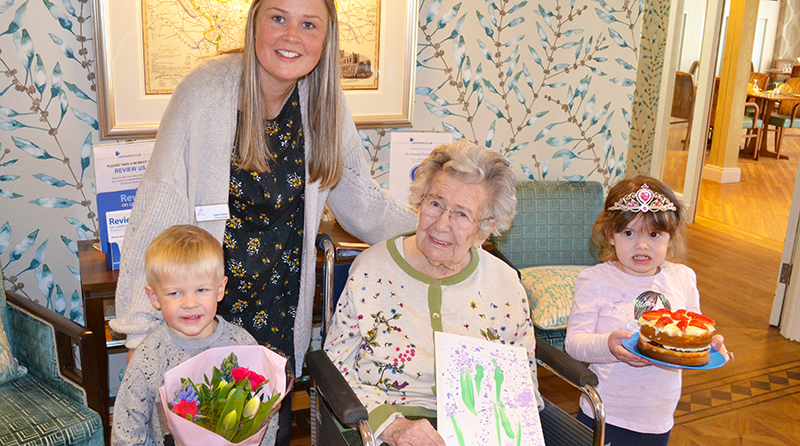 Elmscot Nantwich Day Nursery and Nursery School has been to visit residents at Richmond Nantwich Care Home to join them in celebrating a very special birthday. Alice, one of the Richmond residents, has celebrated her 104th birthday this week. The children at Elmscot Nantwich baked a birthday cake and made a card so they could present Alice with the lovely gifts during their visit. While the children were there, a live pianist was playing which they thought was great fun. They entertained all the residents with their dancing and even finished with a bow at the end. Elmscot Nantwich is part of the Elmscot Group of Day Nurseries and Nursery Schools, providing outstanding childcare and education to over 1,800 children across Cheshire. To find out more about Elmscot Nantwich Day Nursery and Nursery School and the incredible facilities or to register for a place, please contact the Nursery Manager directly on 01270 629 005 or email nantwich@elmscot.co.uk.